Economize R$ 16,04 (25 %). Comprar eBook Kindle. 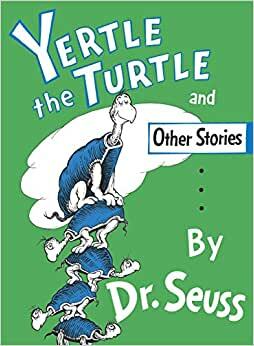 Comece a ler Yertle the Turtle and Other Stories no seu Kindle em menos de um minuto. Illustrated in color. Three modern fables in humorous pictures and verse: "Yertle the Turtle," "Gertrude McFuzz," and "The Big Brag." One of my favorite books as a child and now my children, ages 5, 5 and 8 laugh and love these books as much as I did. We always buy the hardcovers of the classic books so I will have a library when grandkids come along. I realize kindles and iPads are taking over but there's nothing like having those books and pictures in your hand when you're little. 14 pessoas acharam isso útil. 5,0 de 5 estrelasLove Dr. Seuss! Got this for a neighbor's boy who's turning 6. Only skimmed the 1st story but it's a really good one about a turtle (cover) & how he takes advantage of a bunch of other turtles' kindness so he can be "king of the mountain" (I paraphrased). Well, of course, they finally get fed-up & he topples down. Just like some people, dictators, rulers. Also, the price is a whole lot less than what the publisher wanted. 5,0 de 5 estrelasA Classic! An absolute classic and totally relevant today. My 4yr old granddaughter loves listening to Seuss's wonderful prose and loves the art. This was my favorite as a little girl and as an adult, it is still fun to read. Many adults do not realize there are Dr. Seuss books for older children. Sadly few children are exposed to them. In a recent pretest, it was apparent only one of fifty students was familiar with this classic. Ted Geisel not only wished to teach our children how to read, but make them think about the world around them. I use Yertle in my classroom to demonstrate two types of government. I challenge you to look up Dr. Seuss' "big books" and search out what he has to say to you and your children today. I remember this story from my childhood. It is still just as great today. I wanted to pass it on to my great nephews so they could enjoy it as well. My nephew used to beg for this story every day. He is now in his 30s and I had to get a copy for his son. I am so glad it is still available for sale.